Queueing traffic on the motorway near Doncaster. A woman was seriously injured in a three vehicle motorway smash this morning which left thousands of motorists stranded in rush hour traffic. The 56-year-old was airlifted to hospital with serious chest and back injuries after the smash at 7.35am on the M180 near Thorne, close to the M18 roundabout. The collision was between two cars and a van. Early reports also suggested a McLaren P1 supercar was involved but it has since been confirmed that while the vehicle was near the scene it was not part of the crash. 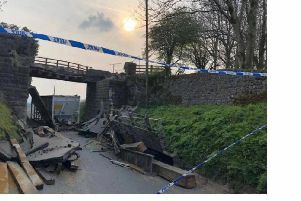 Thousands of motorists were left stuck in the morning commute by temporary road closures and diversions while emergency services treated those at the scene. Two lanes on the westbound carriageway have now been re-opened. One queueing motorist, a 30-year-old from Crowle who works in Doncaster, said: “I was sat in traffic for an hour and 40 minutes - traffic was at a complete standstill. “I saw the air ambulance circling above so I knew it must be serious and about seven police cars turned up. The collision was between a silver Ford Ka, a silver Citroen Xsara Picasso and a white Mercedes Sprinter van. The Yorkshire Air Ambulance airlifted the seriously injured woman, who was driving the Ford Ka, to Leeds General Infirmary for emergency treatment. A 57-year-old man, a 61-year-old man and a 34-year-old man from the Picasso, as well as an 18-year-old man driving the Sprinter, all received minor injuries. A spokesman for the Highways Agency said a stretch of the westbound carriageway of the M180 was closed all morning before being reopened at about noon. A diversion was put in place from Junction 2, near Belton.